Weird pies, strange pasties, rock cakes and love buns?! 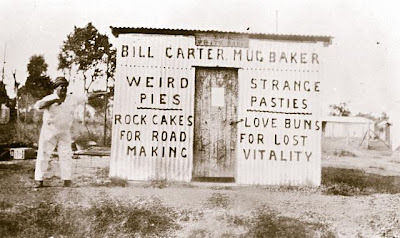 I think Bill Carter may be a man after my own heart! I did a little Google sleuthing about the photo; apparently it was taken in Katharine, in the Northern Territory of Australia by Margaret Kirk in 1936. I found this other view of the shed, but still searching for more about Carter--let me know if you know or find anything. Photo sent to me by my friend Valeda.